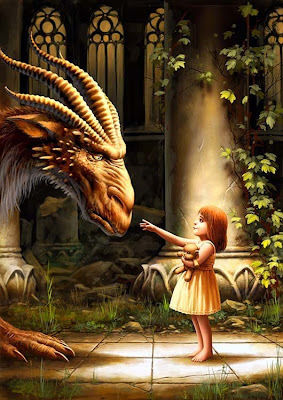 Best Fantasy and Science Fiction: "Dragon Girl"
A child's imagination is an amazing thing. I love dragons, and my 2 year old daughter, almost 3, does too! I occassionally call her my "Dragon Girl" and she will even growl and breathe fire at me occassionally! I haven't taught her that dragon's breathe fire so I'm not exactly sure where she got that from but it is funny to watch her face as she produces the "flame". She loves dragons on a whole new level though. In our son's room, which used to be the office and my wife's craft room, there are numerous dragon statues ranging in size from 10"-18" tall and quite impressive in my opinion. Anyway, one day Dragon Girl was in the room with us while we were putting our son to sleep for the night. All of a sudden she started making a throwing motion towards the dragons which are on a high shelf. I asked her what she was doing and she said quite matter of fact "Feeding the dragons daddy". And boy was she feeding the dragons. Apparently they enjoyed it as much as she did! Soon Dragon Girl was telling me to sit on the dragon so we could fly through the house together. "Like this daddy!" she commanded. It was pretty hilarious, all I could do was smile and well...get on the dragon with her! It was a fantastic ride through the hallway...I was only corrected once on how to ride the dragon. After the trip through the hallway and into the dining room and back, the dragon flew back to his perch on the top shelf; tired and well fed. Quite an amazing journey and an amazing daughter indeed. She sure is sweet and has a very good imagination.